Forum Index > Off-topic Talk > Looking for Floor Standing Sword Displays... recommend? Posted: Thu 22 Oct, 2009 8:20 am Post subject: Looking for Floor Standing Sword Displays... recommend? I'm looking at all the holes I'm going to have to patch in my current rental house and I am thinking I do not want to do that to the new rental house since I will most likely only be there 1.5 years (hoping to buy a house when I save enough for downpayment). So far these are all I have come up with... Anyone else have anything they recommend that is nicer/different, and anything that works well for other types of weapons like Flails, spears, maces, etc? This is not great but it seems you can space it however you like? A staff display, could be good for spears? Any higher quality stands? (I guess ultimately you could do your own woodworking or hire a woodworker). My rental-living rack was a concrete block/brick with wooden uprights, with screw in hooks (dowel pegs would be better). Stability through a monstrously heavy base! A lot of commercial racks are very short (you could fit them on a table), so if you're happy to want it on a floor, you could fit a lot more on it if you make it taller. Or spread the racked items out; some of these short racks are a bit cramped - I use one as a nice compact bokken/waster rack, but it would be pretty ugly as far as serious display goes. So, I guess I'm suggesting DIY rather than buying. It isn't so hard, you just need some cheap pine, and hooks or dowel. Saw, bit and brace or drill. Paint, varnish, or wax. I'd avoid those "fan" racks for spears - I will be traditional and rack horizontally or vertically (and the first rack might get made this coming weekend, but I doubt it - I need to line a wall and build a 1/2 wall/bench/cupboard first). 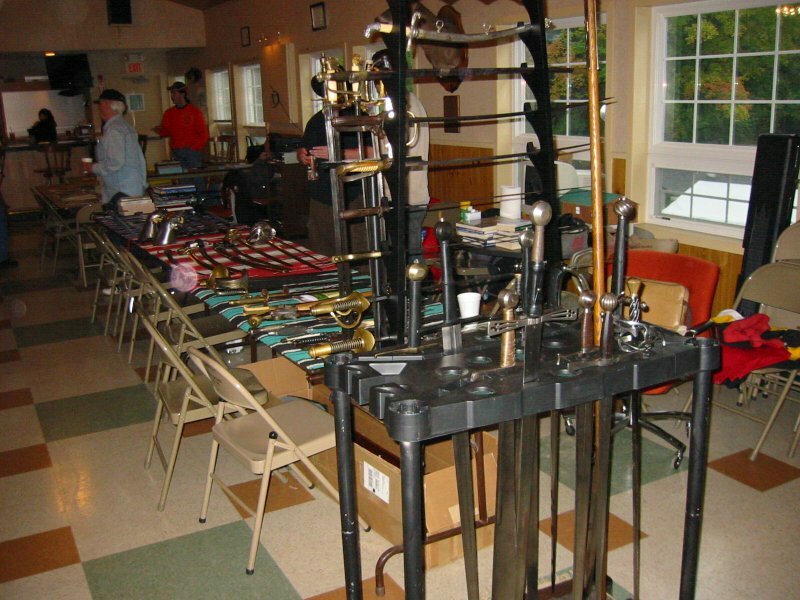 While shown on a table here, these two generic racks are inexpensive and usable ether at table height or on the floor. The cane stand for smaller straight stuff holds eight, as does the other wider stand (that I use as a clothes tree at home). The Rubbermaid long pole holder can take a couple of dozen mixed blades and polearms. Although quite useful in the field, I use it covered as a small book reading desk/shelf at home. Painted black, it blends better than the beige and green these come in. There is a corner model of the Rubbermaid as well that is triangular in floor foot print. Sectioned poles let them be either highboys or half height. The big one has holes of all shapes and long slots which would fit any blade. If longer than the item, a cover on the base will protect a foor or carpet from bare points and pole arm shoes. A caution on the cheap composite wood displays. Screws strip out the material easily, as does the anchors in the case of that cane stand. Like so many other things, quality can be a factor of cost. There are much more expensive ready made display stands and many plans are available for the home hobbyist. I opted for ease and cheap. The Rubbermaid stands really do rock for this but are not terribly attractive. Excellent for break down and transport though and virtually flyweight while being quite sturdy when loaded with swords. I have had all the slots full in testing and as sword weight is low racked such, quite stable. Nice to see the photos of how they look in real life, thank-you. I did some searching, and it seems Chad has a nice fan display inside a glass display, that is very nice setup. The only thing I like about horizontal and vertical displays is that I can store the scabbard in the slot adjacent to the sword. With the Fan Display, you really can't do anything with the scabbards. 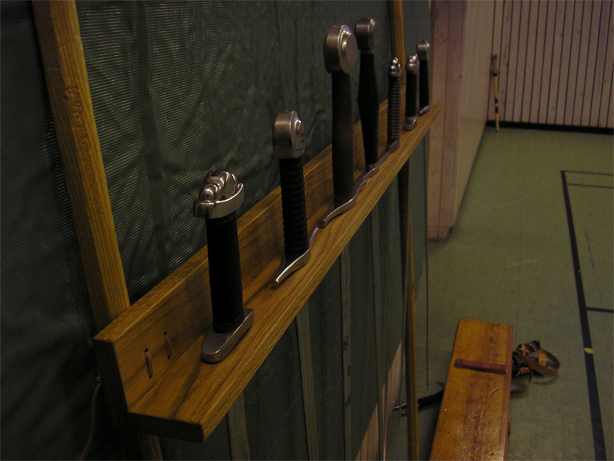 This one remains appealing simply because it is the tallest rack, and holds 20 swords. You could put the scabbard in the back and the sword in the front... But I think you would be hiding the scabbard too much. with brackets or hooks or such attached? No drilling, won't fall over if bumped. (Some of the taller floor stands are not so stable.) Tall enough so that you can keep things at eye level, rather than at shin level. The "horizontal rack for pole weapons" (I'd call this a vertical rack, since the weapons are vertical) is nice, but it doesn't hold very many. I'll do one of these DIY for my shorter polearms, possibly wall mounted. Those DIY racks look great. I contacted my woodworking guy with the CNC machine and I think I'll go that route. HOWEVER, nobody has discussed how to deal with displaying the scabbards? Do you make a place for them to sit on another row slightly offset posteriorly, between the swords, with slightly greater spacing between swords? How do people display the scabbards as well??? I don't currently display mine. I don't have great scabbards for every sword, nor enough room to display swords and scabbards. 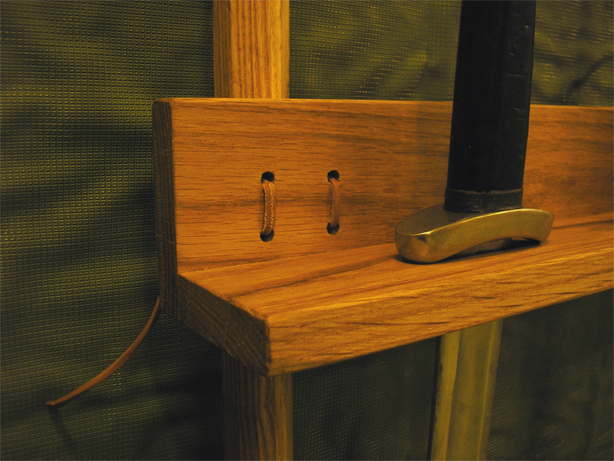 If I did have room, I'd fashion a display that allowed each scabbard to go next to its sword. But I wouldn't do it in a floor stand. Many floor stands work by enclosing the lower end of the item. For some scabbards, the chape is one of the more interesting parts and I may not want it obscured. I outgrew this one and took it apart, but it's very simple to make. I'm excited to build something!!! Thank-you for reposting your picture Sean. It did come up in my searching, and I am glad it is now in this thread. It is a lot like a supercharged cane holder! How am I going to work in the Maces, flails, and axes.... UGH!!! Hope this may give you some ideas and maybe stimulate you into trying your hand at making your own. After all, you are the one who knows what you really want. Try making a design and making it. I agree, seems like DIY time! We have a large number of wooden frame lancet arch leadlight windows turn up at building recyclers etc from our older colonial buildings. They were the inspiration for these plans. This may not be what you're looking though! ebay seller legendarysword seems to have decent choices and some variety at good prices. I like the 10 sword rack that folds flat for storage. Looks like it would be quite stabe when loaded. Very smart solution to use a corner like that, mind if I "borrow" the idea for my home too? Terry, I would not use that one. Better than the standard stand that Hanwei delivers but still very unstable. It might also not be healthy to have the points of swods sticking out in your livingroom! Hmm... This got me thinking of a stand to put on the floor but close to a wall so you can put them up like if on the wall but still being able to move it. It would also be nice it I didn't have to make lots of holes in the wall... Have to give this some more thought. Is it ok to let the tip of the sword rest against the wood bottom? I was thinking of making a stand like the above, but 2-tiered (another row above) with wider spacing between the swords, and also allowing for the scabbard to be placed along side. My concern is that the tip actually sits on the wood, since the swords just lean in the rack. Is that ok? I think having another row above would make better use of wall space. Please feel free. By the way, the polearms are secured behind the display with a spring-clip system used for organizing tools--very secure, but easy to remove the arms.